WASHINGTON – Congressman Jerry Nadler (D-New York) was swimming against the current at John F. Kennedy International Airport Saturday night, lobbying for the release of vetted refugees and visa holders who hoped gain entry to the US as President Donald Trump signed an executive order banning their entry. He succeeded in securing the release of Hameed Khalid Darweesh, an Iraqi national who worked for the United States Army as a contractor and interpreter for nearly a decade. Darweesh was detained for 14 hours after the president on Friday directed the Department of Homeland Security to turn away all citizens of Iraq, Iran, Libya, Somalia, Sudan, Syria and Yemen. There were at least 10 additional foreign nationals stuck at JFK on Saturday morning. The scope of Trump’s executive order has caught state and federal law enforcement officials off guard. Citizens from these countries – which together comprise of 134 million people – will not be allowed entry into the US even if they are green card holders, or hold dual nationality with countries that are not listed. Particularly irksome to Nadler, one of Congress’s most prominent Jewish voices, is the president’s decision to sign the order on International Holocaust Remembrance Day. Several major American-Jewish organizations have joined Nadler’s cause: The Anti-Defamation League and the American Jewish Committee both released strong statements of disapproval, characterizing the order as cruel and contrary to Jewish values. Nadler expects to lead a “raucous” revolt against the measure in the House, and said he expects a class action suit would proceed in the Eastern District of New York. “There are good grounds for saying this is unconstitutional,” Nadler said, still at the airport. 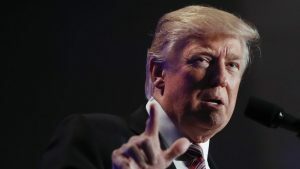 WASHINGTON — US President Donald Trump issued a statement on International Holocaust Remembrance Day Friday in which he vowed to combat the forces of evil, and called to “make love and tolerance prevalent throughout the world,” but failed to mention Jews or anti-Semitism. The absence of any specific mention of Jews or anti-Semitism was highlighted and criticized by the Anti-Defamation League (ADL). ADL CEO Jonathan Greenblatt promptly took to Twitter to exclaim it was “puzzling and troubling” that the 117-word statement did not specifically cite the persecution of the Jewish people that was central, though not exclusive, to the Nazi genocide. In his statement, Trump vowed to use the power of the presidency to safeguard the world from allowing an atrocity such as the Holocaust to repeat itself. It is not the first time an international leader has failed to mention Jews while honoring the memory of those murdered by Adolf Hitler’s regime. Last year, Canada Prime Minister Justin Trudeau caused a similar reaction when he issued a statement that lacked any reference to Jews or anti-Semitism. This year, Trudeau avoided making that a tradition. “Today, on the 72nd anniversary of the liberation of Auschwitz-Birkenau, we remember the more than six million Jews murdered during the Holocaust and the countless other victims of Nazi brutality,” he said. 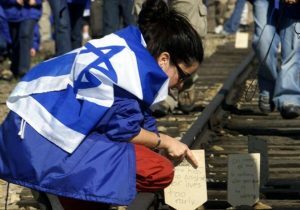 Trump was among several world leaders who devoted statements in memory of Holocaust victims on International Holocaust Remembrance Day, which in 2005 the United Nations set for Jan. 27 — the day in 1945 that the Red Army liberated the former Nazi death camp Auschwitz-Birkenau in Poland. More than 1 million Jews out of the 6 million murdered in the Holocaust were killed there. In Germany, outgoing Foreign Minister Frank-Walter Steinmeier, who is to become president this year, noted during a speech the political instability in the world today. On October 16, 1943, 45-year-old Settimio Calò left his wife Clelia and their nine children comfortably asleep in their apartment when he snuck out at dawn, hoping he would be able to buy some cigarettes — a rare treat in Nazi-occupied Rome. When he got home a few hours later, he found the place in Via del Portico D’Ottavia, the heart of the former Jewish Ghetto, completely empty. The Nazis had raided the neighborhood and rounded up over 1,000 Jews. Of them, only 15 men and one woman survived Auschwitz. All Calò’s children, including little Samuele, just a few months old, were murdered. “Today many people have forgotten about the Holocaust. The number of survivors was already small immediately after it, and 72 years later very few can still tell their stories firsthand. This is why doing it when I have the opportunity is an imperative for me,” Holocaust survivor and Israeli racewalker Shaul Ladany says in a phone conversation with The Times of Israel. Ahead of International Holocaust Memorial Day, Ladany — who was at the 1972 Munich Olympics and survived the horrifying terror attack on the Israeli delegation — was the guest of honor at an event in Rome aimed at promoting Holocaust remembrance and the awareness of its importance. 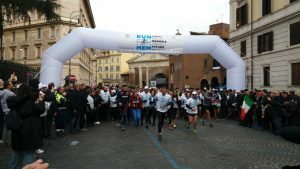 “Run for Mem,” a non-competitive road race past sites related to the history of the Holocaust in the Italian capital, took place on Sunday, January 22. Via del Portico D’Ottavia, where the Calò family was arrested along with so many others, and which today remains at the heart of the Jewish life in the city, was the epicenter of the race. The little square behind the Great Synagogue named after the date of the Nazi raid, Largo 16 Ottobre 1943, served as the start and end point. About 1,500 people took part in the initiative, which was organized by the Union of Italian Jewish Communities, with support of Maccabi Italia (a branch of the renowned international Jewish sports organization) and the Rome Marathon. “This year we chose a new, maybe even brave way to mark Holocaust Memorial Day — a sporting event,” President of the Union of Italian Jewish Communities Noemi Di Segni said, opening the race. “People happen to run every day, but today we have to take with us the milestones of our history and remember that the path ahead of us starts from the one influenced by past events. Sometimes people fall and are hurt. They have made us fall, they have hurt us, but we have gotten back to our feet and we have started again, as individuals, as a people, as a community, as Italians, as Europeans,” she concluded. “Run for Mem” also received the support of over two dozen Jewish, civil, government and sports organizations, including the World Jewish Congress, the European Jewish Congress as well as Prime Minister of Italy Paolo Gentiloni. Among those who attended were members of the Italian government, undersecretary for European Affairs Sandro Gozi, Italian runner Franca Fiacconi, Imam Yahya Pallavicini and Israeli ambassador to Rome Ofer Sachs. The high interest for the event especially moved Ladany. “I must say that I was really pleased to be invited to this event and impressed by the work done by the organizers, including the fact that there were so many journalists and so much interest around it. A lecture could have never drawn as much attention,” Ladany points out. The 80-year-old racewalker opted for the longest route of 10 kilometers (6 miles), finding some similarities with the Jerusalem Marathon. “The Jerusalem Marathon, with so many ups and downs, is hard, but the landscapes are wonderful. Same here in Rome. Amazing views, the Colosseum, the Forum, but a tough one, especially because the stone-paved streets were far from being smooth,” he said. Ladany, who is a professor emeritus of industrial engineering at Ben-Gurion University, also recalled a time in Israel when there were no marathons at all. “Today there are several, with thousands of participants. When they held the very first one from Hadera to Zichron Yaakov as an Olympic trial in 1956, there were maybe 10 or 12 participants, myself included. Shortly after, they started to organize racewalks. I have been racewalking ever since,” he said. The two routes offered by “Run for Mem” (the shorter of which was 3.5 kilometers) took the runners around the city, passing by streets and buildings which witnessed the Nazi cruelty, as well as sites that speak about the courage of those who risked their lives to help people in need. Participants, who all wore t-shirts bearing the slogan “Race for Remembrance, Looking Ahead,” ran by the Regina Coeli prison on the Tiber river, where Jews and political prisoners were detained. They also passed by the building on Via Urbana where Father Pietro Pappagallo lived. The hero had helped victims of the persecution and resistance fighters until he was arrested and killed by the Nazis in the infamous Ardeatine Caves massacre of 1944. The longer route passed by the building in Via Tasso that served as SS headquarters and which today houses the Museum of the Liberation. The shorter one cut through the small Tiberina island, where physician Giovanni Borromeo hid hundreds of Jews from the Nazis. Many of them were diagnosed with the fictitious “K. disease,” which kept German soldiers, afraid of contracting contagious diseases, at bay. Borromeo was recognized as a Righteous among the Nations by Yad Vashem in 2004. “The sites featured in this road-race symbolize the history of the persecution, devoting attention also to what happened to Roma people, political opponents and members of the gay community,” commented Maccabi Italia president Vittorio Pavoncello, speaking to Sky News Italy. The “Run for Mem” itinerary also included the Via degli Zingari, where a plaque commemorates the oppression of the Roma people. Speaking from his hotel in Rome, Ladany, who was sent to Bergen Belsen with his family as an 8 year old, explains how being a survivor has influenced his life. “It shaped me to be ambitious, to set high goals. Out of the first eight years of school, I only attended four, in four different languages. Therefore, my first goal was to graduate high school. Then it was to become an officer in the Israeli army, to get a degree, a second degree, a PhD, a position as a lecturer, professor, tenured professor. And simultaneously, to become an Israeli champion, set a world record, take part in my first Olympic Games, and then in my second,” he said passionately. His second Olympic competition was in Munich, where 11 Israeli athletes were killed by the Palestinian terror group Black September. Ladany managed to get out of the building. “Munich was just yet another situation where I found myself in mortal danger and I survived,” he explained. “I think that another consequence of my experiences during the Holocaust, when I lost 28 members of my immediate family, is that I am not afraid of anything. Asked what role sports and athletes can or should play in influencing the world, he explained that there are those who like to speak up, and those who don’t. “When asked, I personally always expressed my opinion, even if it meant going against the mainstream view,” he said, remembering how after the massacre at Munich, he opposed the withdrawal of the team because he felt it would give the terrorists what they wanted. “I also think it was right that the Olympics went on. When Baron de Coubertin started the modern Olympic Games, he had in mind the ancient ones which marked a moment of truce between the different Greek city-states. Nowadays, many things have changed. There is the doping, the money… However, this should not change,” Ladany says. At the end of the “Run for Mem” all participants crossed the finish line together. What better could embody the idea so dear to de Coubertin that what counts is not winning, but participating, than a Race for Remembrance? If there is anything that can infuse some meaning into the murder of our loved ones, it is that we will create such unity that will prevent such a fate from reoccurring. Today, on January 27, 2017, the world is commemorating the International Holocaust Remembrance Day. Today, the world is once again increasingly antisemitic. Today, we can stop a Second Holocaust from happening, because it will, unless we take assertive action. Shortly before the expulsion from Spain, the Jews eagerly assimilated among their Spanish hosts, wrote the acclaimed historian Jane S. Gerber in The Jews of Spain: A History of the Sephardic Experience. Spanish Jewry considered Spain the new Jerusalem, and thought that “the presence of so many Jews and Christians of Jewish ancestry in the inner circles of the court, municipalities, and even the Catholic church could provide protection and avert the decree” of expulsion. They were wrong. Like their brethren in Spain, German Jews believed that if they assimilated among the Germans, they would be safe from the eternal finger pointing that is the lot of the Jew. Professors Steven J. Zipperstein of Stanford University and Jonathan Frankel of the Hebrew University in Jerusalem, write in Assimilation and Community: The Jews in Nineteenth-Century Europe, that a few years after the start of the Jewish emancipation, David Friedlander, one of the Jewish community’s most prominent leaders, suggested that Berlin Jews would convert to Christianity en masse. We are remembering today how this assimilation ended. The nations cannot solve the riddle of our survival; only we can do this. We Jews are unlike any other nation. We may want to be, but the fact that the entire world criticizes us every day, that the UN Security Council debates almost exclusively about Israel, and that Jews are the main target of hate crimes not only in Europe, but even in the US, proves that we are by far the most hated nation on the planet. Donald Trump’s inauguration as President may give us a hiatus from overt Jew-hatred, but if we do not respond correctly to the opportunity, the backlash will explode in our faces, quite literally. Even if President Trump vetoes all the anti-Israel UN resolutions, this will not abate the hatred that the nations feel toward us. Sooner or later, he, too, will have to reconsider his position. So, to avoid another Holocaust, we must understand our unique position in the world and act accordingly. Mel Gibson’s infamous 2006 rant, “The Jews are responsible for all the wars in the world,” like General William Boykin’s statement, “The Jews are the problem; the Jews are the cause of all the problems in the world,” reflect a gut feeling that to some extent, the entire world shares. Worse yet, the more unsolvable the world’s conflicts become, the more the world blames the Jews for them. Consciously or not, humanity remembers that immediately after we committed to unite “as one man with one heart,” we thereby became a nation that was tasked with being “a light unto nations.” Even if people cannot verbalize it, they feel that the light we are to bring to the world is the light of unity and peace, that unique union we had achieved at the foot of Mt. Sinai. Therefore, as long as there are hatred and war in the world, there will be antisemitism. But to bring peace, we must understand its meaning. When our sages spoke of peace, they did not refer to absence of war. To avoid war, we can simply avoid contact. The word shalom (peace) comes from the Hebrew word shlemut (wholeness). To make peace means to make whole. It is to take two conflicting opposites and unite them in such a way that they make a new whole. It is an entity that is neither, yet is the offspring of both, a creation that could not have been made without both and which they both love dearly. Just as a man and woman together create a child who is neither the mother nor the father, but who is the beloved creation of both, peace is the resulting wholeness that two opposite, conflicting views create. To understand in what way we should unite in order to become that light, think of our bodies. The diversity of organ functionality in our body ensures our health. The liver, heart, and kidneys work very differently, and all require blood. If we did not know that these organs complement each other to maintain our health, we might think that they are vying for the same resource. Yet, without each of them we would die. Just like our bodies, “humanity” is not a generic name for “many people”; it is an entity of which we are all parts. When we view ourselves as separate beings, we have to fight for survival. But if we rose above our petty selves just for a moment, we would discover a very different reality—where we are connected and mutually supportive. “This,” continues Baal HaSulam, “is the proof of the obligation to caution with the freedom of the individual regarding concepts and ideas, for the whole development of the wisdom and knowledge is based on that freedom of the individual. Thus, we are cautioned to preserve it very carefully.” Peace, therefore, is possible only when we are different, yet mutually supportive, when we unite above our differences. If we do not convey this principle to the nations, they will not find it on their own and they will blame us for their wars. Philosopher and historian, Nicholai Berdysev, wrote in The Meaning of History: “The survival of the Jews, their resistance to destruction, their endurance under absolutely peculiar conditions and the fateful role played by them in history; all these point to the particular and mysterious foundations of their destiny.” But what Berdysev cannot know is the specific nature of our fate, the meaning of being “a light unto nations.” If we want to avoid another round of genocide, we must begin to do what we were meant to do. I lost almost my entire family in the Holocaust. But I understand that merely remembering them does not excuse us from action. Remembrance will not bring them back or prevent a repetition of the horror. Only our unity above our differences, precisely as described above, will establish peace among us and make us a role model for the rest of the world, “a light unto nations.” If there is anything that can infuse some meaning into the murder of our loved ones, it is that we will create such unity that will prevent such a fate from reoccurring. MUNICH — In 2000, the United States Holocaust Memorial Museum in Washington, DC, tasked researchers with creating a comprehensive, single-source record that would accurately document the thousands of persecution sites the Nazis had established. The USHMM estimated that the team would uncover about 5,000 persecution sites, which would include forced labor camps, military brothels, ghettos, POW camps, and concentration camps. But as the research got underway that number skyrocketed. In 2001, the number had doubled. A few years after that, researchers had already discovered 20,000 sites. Now, the “Encyclopedia of Camps and Ghettos, 1933-1945” contains more than 42,500 sites that the Nazis used to persecute, exploit, and murder their victims. “But quite frankly, you could put it much higher than that,” said Geoffrey Megargee, the project leader, who has coordinated the publication of the first two books of the seven-book series. The final encyclopedia book will be published in 2025. “You could not turn a corner in Germany [during the war]… without finding someone there against their will,” said Megargee, speaking ahead of Friday’s International Holocaust Remembrance Day. For Megargee, counting the sites was one of the main challenges of the project. For example, there were camps that changed purposes over time and brothels that existed within camps. To err on the side of caution, sites like these were counted only once. Researchers also refrained from counting sub-camps, of which there were tens of thousands. For researchers to conclude that a site had existed, they could not just rely on one person’s testimony. It was imperative that multiple witness testimonies and official documents corroborated each other in order for a site to make the series. Because a gap of more than half a century existed between when the last camp was liberated and when the project began, one can only imagine how many sites will remain forever unrecorded. Not only were records and testimonies destroyed or lost during and after the war, they were also in a myriad of languages, or hidden by embarrassed, indifferent or unapologetic parties. Some were taken to graves by witnesses and victims who had died before the new millennium. Still, the number of persecution sites discovered was more than eight times that which experts at the USHMM — the vanguard for Holocaust research — had predicted. Perhaps, however, it was only possible to reach this shocking figure precisely because of the passage of time — for time brought to the project an element that nobody had foretold. When Hermann F. Weiss decided to dig into his family’s past in 2001, his siblings had disapproved. His brother told him that there was already enough written about the Holocaust. Weiss disagreed. His father, whom Weiss describes as an “accomplice,” was an engineer overseeing the construction of infrastructure for Schmidding, a German missile development company. Weiss needed answers. His father’s role during the war had haunted him. After pouring through this limited number of documents and survivor memoirs, Weiss frequently turned to a practice despised by those forced to use it: cold calling. For example, he had read a memoir about a forced labor camp in Silesia that accused a commander named Kurt Pompe of barbaric acts. Weiss had learned that the first name of Pompe’s youngest son was Herbert. He found six Herbert Pompes in the German online phone directory, and his second call was answered by Kurt Pompe’s daughter-in-law. The conversation revealed a number of things, including where and when Kurt Pompe had died. This fact allowed Weiss to uncover Pompe’s denazification file, which showed that the Americans had been unaware of Pompe’s crimes. Weiss set the record straight in a Yad Vashem publication, and, in much briefer terms, in encyclopedia entries for camps where Pompe had committed his crimes. “The encyclopedia entries have to be very condensed,” Weiss explained, a hint of regret in his voice. Weiss’s research helped him to produce about two dozen entries on forced labor camps in Silesia for the encyclopedia series. Prior to his digging, most sites had little information published about them. Six sites, in fact, had never been written about before and were Weiss’s very own discoveries. And yet some of Weiss’s most indelible memories from his research have no place in the encyclopedia. For instance, on a trip to Silesia, Hermann Weiss discovered one undocumented persecution site that appeared as it would have days after the arrival of Soviet troops. Villager testimonies allowed Weiss to locate six unmarked graves, where three Poles and three Jews who had been murdered were buried. Four of the six mounds were still visible. There was no space in the encyclopedia to tell these stories. But like the specter of his father’s work, it was these stories that gnawed at him. Katherina von Kellenbach had grown up referring to Alfred Ebner as her uncle. Yet when the family got together with Ebner after World War II, his presence at the table never sat quite right with von Kellenbach. Ebner had been responsible for setting up, running, and orchestrating the mass killings of more than 20,000 Jews in Pinsk, where 86% of ghetto residents were women and children. After the war, when the courts pursued top Nazis, Ebner was granted clemency, having been diagnosed with a form of dementia. But at the family table, he seemed perfectly fine to von Kellenbach. In fact, the other family members had viewed Ebner as the victim. They considered that it was Ebner who had suffered because of these so-called unfounded accusations. If the courts would not hold Ebner accountable and if Belarus had no public memory of these atrocities, von Kellenbach decided that she would investigate. In 1999, she began her inquiry into her uncle’s past, visiting the Yad Vashem archive to gather data on Pinsk. But many documents were in Hebrew or other languages foreign to her. She needed help making sense of things. When she learned of a survivor from Pinsk who could be of assistance, she hesitated. “It was hard to call up some survivor and say ‘I’m the niece of Alfred Ebner,’” she said. But that’s just what she did, and for two days she and survivor Nahum Boneh sat at his kitchen table with all of the documents, unpacking Ebner’s crimes. For years, von Kellenbach worked to rescue documents trapped in other countries’ archives and at times had to run a cloak-and-dagger research operation. Since authorities would never have allowed her to conduct an unfettered investigation on a well-known perpetrator from the Pinsk region, she pretended to research partisans stationed in the vicinity of Pinsk. This gave her access. Her family cast a hostile eye on her work. But the research whittled at the lies, and Ebner’s credibility in the family weakened. For the most part, everyone stopped protesting her efforts, though Ebner’s children continued to view their father “as a good man, who helped many people,” said von Kellenbach. During one session with the documents, von Kellenbach had discovered writings in which a police officer under her uncle’s command complained about not knowing whether he should kill the child before the mother, or vice versa. On the day in question, Ebner had orchestrated the murders of more than 7,000 people. “There’s no way you walk out [from the archive] at 5:00 p.m. as a human being,” von Kellenbach said after reading those documents. The researchers are far more diverse than the relatives of perpetrators and accomplices. While the project has many dyed-in-the-wool historians on board, there are researchers who survived one or more of the 42,500 sites, as well as the descendants of survivors. Hannah Fischthal, for example, researched sites where her uncles had been imprisoned. Her work has helped to debunk inaccuracies. Karwin is a camp where her uncle had been imprisoned. It had always been considered a POW camp because of how it was characterized in a documentary film about an Italian prisoner. But Fischthal proved that Karwin was, in fact, a predominantly Jewish camp. The record was corrected and the Jewish victims were recently honored with a plaque at the site. Some researchers are finding camps in the way paleontologists might dig up dinosaurs. Now that the technology is available, forensic archaeologist Caroline Sturdy Colls has conducted ground-penetrating radar research near Adampol, where she has uncovered buried evidence that corroborated witness testimony and yielded new finds. Martin Dean, who worked as the series editor on the encyclopedia before leaving the museum and the project at the end of 2016, had originally been employed as a war crimes investigator with Scotland Yard. Dean had spent years building cases against perpetrators, but most yielded inadequate results — some former Nazis were excused because of poor health, others died before being brought to trial. While Dean’s expertise as an investigator was restricted by the courts, his acquired knowledge helped to correct the record for numerous previously unknown persecution sites, including some of the 300 ghettos that had never been documented before this project. About 14 kilometers (eight miles) north of Munich, is the town of Unterschleissheim. The entire area was once a persecution site, and researcher Max Strnand helped to document the Lohhof flax-retting plant, the camp that had once occupied these grounds. Besides the camp, Strnand explained, there was hardly anything in Unterschleissheim during the war. The location then only had a train line, a warehouse, and a tower, all of which still exist today: the train station is just down the road from where the warehouse and tower — now swathed in modern day advertisements — sit inside a locked compound. 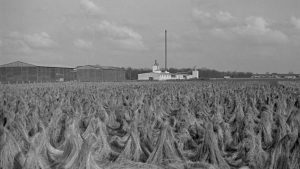 Because the land had been empty, the Nazis brought Jewish slaves and POWs to the fields to lay and dry out flax. The fibers from the stalk were then brought to the warehouse, where they would be stored as raw materials for linens. Before Strnand, there was no single source that told the story of the camp in Unterschleissheim and facts were scattered about like confetti after a hurricane. But Strnand patiently unearthed an entire history, including information about the prisoners, of which there were typically 200 at any one time. “We don’t know if people were executed here, but there were many accidents,” Strnand said. He noted, however, that only 10% of Jewish prisoners who came through Unterschleissheim survived the war, as the Jews from this camp were usually sent directly to extermination camps like Treblinka or Sobibor. “This topic is something that concerns everyone who lives here,” Strnand said, who now sees his book about Lohhof implemented into local schools’ history lessons. Prior to his book’s publication, most people in town had never known that a camp had existed. According to the city’s Head of Culture, Daniela Benker, there are plans to build a memorial site by 2018. But since the structures belonging to the former camp are behind a gate on private land, the aim is to build a memorial elsewhere — perhaps at the train station down the road — where it can be visible to the public. While Strnand walked the site, a truck approached the compound and the gate opened. He followed the truck inside and found a hulking electrician ending his day. Strnand introduced himself and asked permission to walk the grounds. The electrician pulled out a key that accessed a supply shed, a former Nazi bunker. The bunker looked like a typical storage shed; however, the reinforced roof that once provided additional safety against a bombing was still visible. What was most shocking was Strnand’s surprise. The researcher, who knew more about the camp than anyone else, was seeing the insides of this building for the very first time. Even the experts were still uncovering new facts about the hidden stories of the Holocaust. The truth is much will remain unknown about the victims or the places that the Nazis used to dehumanize people and commit murder. But the encyclopedia series is the largest effort to most thoroughly document as many sites and include as much testimony as possible. When it is completed in 2025, many of the project’s researchers will still continue their work. After Hermann Weiss finished correcting the record on Kurt Pompe, the Nazi from Silesia, he looked into the records of other criminals never brought to justice. Weiss came across hundreds of testimonies about a man named Hauschild, one of the most sadistic perpetrators in the Silesia region. Despite the accounts and accusations against Hauschild, the man remains Weiss’s greatest puzzle. Weiss cannot connect him to any particular Nazi organization and thus cannot condemn the man or his record accurately. WASHINGTON (JTA) – He’d rather talk to young women than answer my insistent line of questioning. He speaks in terms that make me feel like a Luddite, and when I bring up stuff he’d rather not talk about, out comes the smartphone. Omar, a Syrian refugee passing time in a Berlin cafe, is not much older than my teenage son — and his mannerisms and conversational strategies make me feel, well, like a dad. But he has seen enough grief to pack into several lifetimes, and the difference between Omar and the millennials and teenagers wandering through the US Holocaust Museum in Washington, DC, on a recent Wednesday becomes evident when I ask him what was the best thing that happened to him this week. Omar — he only wants his first name used — appears to be in his late 20s. He’s participating in an exhibition at the museum, “Genocide: The Threat Continues,” and we’re conversing, face to face, via video chat. I’m in DC and he’s at the cafe in Germany’s capital. Once a visitor traverses an exhibit covering genocides recent (Yugoslavia, Cambodia) and current (Syria), you reach the “portal.” It’s designed to look like a shipping container, replicating the makeshift shelters that have been built for refugees in Jordan and Kurdistan. Inside is a large video screen that allows you to see and chat with a refugee in real time. Visitors can make appointments using an online schedule, though many of the visitors are drop-ins. I didn’t notify the museum, wanting to replicate as best I could the experience of an average visitor, so Omar at his bustling café is matched with me at random. Berlin’s refugees are mostly from Syria. There are other portals in Kurdistan, where refugees from areas in Iraq controlled by the Islamic State interact with visitors, and in Amman, where there are refugees from the fighting in Aleppo. Admittedly, my question, “What is the best thing that happened to you during the past week?” is a bit moronic. 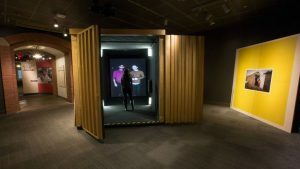 But in my feeble defense, it’s also on a list that the museum and the company operating the temporary exhibit, Shared Studios, provides visitors entering the portal. My immediate sense is an oxymoron — I feel both disjointedness and intimacy. Omar is right across from me in his dark, welcoming eatery, but he isn’t. I pose in front of the screen for a selfie (he begrudgingly agrees, extracting from me a solemn pledge not to share it), and in the image he stands beside me, frowning, like a glittering ghost. 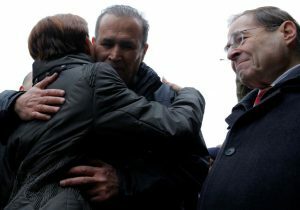 I want to know more about Omar’s aunt; I know from loved ones dying far across an ocean. But I can’t press too hard because I don’t know this young man, who sports a goatee, a green sweater and a green cap. He’s already wary because I’m a reporter — and wary, I think, because I’m a reporter for a Jewish news agency. But these simple lines of questions, I later learn, are kind of the point. Cameron Hudson, the director of the Simon-Skjodt Center for the Prevention of Genocide, says the idea is for the museum visitor to transition from informed to emotionally involved. However, my profession has thrown off Omar. As much as I want to pretend I’m an American casually acquainted with the genocides now underway, professional courtesies mean I have to start by explaining who I am, what I do and for whom I work. He shares information about how he got to Berlin and where his family lives, but he asks me not to repeat that information. He casts his eyes down for much of the talk. Our conversation has moments when he conveys the frustration of interacting with someone who Just. Does. Not. Get. It. But I think this is a product of our age gap. “What do you do like about Berlin?” I ask. “Syrian food, friends, shisha,” or waterpipe smoking, he answers. “No,” he says — and it’s in that response, followed by a chuckle, that I detect the impatience of the young for a hopelessly clueless elder. Not sure why it’s ridiculous to ask, I move on. “We are the same, but we have different religions,” Omar says, adding quickly, “I mean Jewish people, not the Israeli people.” Perhaps registering whatever expression flickers across my face across this electronic void, he corrects himself again. “Even that, I don’t have a problem with both,” he says. Is he aware of Germany’s history with the Jews? Yes, and for the second time, his voice becomes emotional, and I feel like we’ve connected. And then, just as sure as we connected, he drifts away. He starts examining his phone. He’s developing an app, he tells me. It’s time for me to go. A young woman who has signed on recently as a docent for the museum enters. Omar seems more interested in her. “Where in New York are you from?” he asks her. Maybe he’ll exchange Facebook info with her, as he did with the women who preceded me. Hudson loses patience with me a day later when I describe the interaction with Omar about the Holocaust, in the polite way activists for social change tell those of us less focused to, well, focus. That’s true. What’s also true is I’m a bit of a Luddite in late middle age who cannot help but be unsettled by the experiences of the young man who is missing his family, thinking of his aunt, who has been unsettled by the scope of the inhumanity that occurred both in his home country and on the soil beneath the hardwood floors of the cafe where he now sits chatting with strangers. WASHINGTON — With three days left in his presidency, Barack Obama made his final appointments to administration positions, including adding 10 members to the Holocaust Memorial Council. Most notable on that list is Ben Rhodes, a long-time Obama aide and speechwriter who managed the White House messaging on selling the Iran deal and explaining the US decision to abstain on a United Nations Security Council resolution last month that condemned Israeli settlements as illegal. 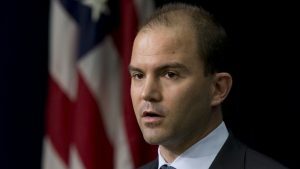 Rhodes, whose official title is deputy national security adviser for strategic communications, was a source of controversy after a New York Times Magazine profile portrayed him as bragging about misrepresenting the nuclear accord to shape American public opinion. In the article, Rhodes spoke of creating an “echo chamber” of nongovernmental organizations, nuclear proliferation experts and journalists to gain support for the deal, as well as portraying a false impression of Iran’s regime. A former graduate student enrolled in New York University’s creative writing program, Rhodes decided to enter the realm of public policy after witnessing the terrorist attacks of September 11, 2001. After spending some time in the Washington think-tank world, he became a foreign policy speechwriter for candidate Obama in 2007 and remained a staffer in his White House for the entirety of his tenure. Obama also deployed the 39-year-old spokesman as a media envoy to explain his administration’s decision to allow a resolution that called for an end to all settlement construction in areas Israel captured in the 1967 Six Day War. Beyond a number of interviews with US broadcast media, Rhodes conducted a conference call with reporters moments after the motion passed, explaining that Prime Minister Benjamin Netanyahu ultimately created the outcome of the vote with the policies he instituted. “Netanyahu had the opportunity to pursue policies that would have led to a different outcome today,” said Rhodes, who has a Jewish mother and Episcopalian father. After the Israeli premier and other high-level officials said they had “ironclad” evidence the United States drafted and lobbied on behalf of the measure, Rhodes took to the interview circuit to deny the charges. In a particularly personal dig, Israel’s ambassador to the United States and former GOP activist, Ron Dermer, told multiple news outlets that Rhodes was an “expert in fiction,” presumably alluding to his unsuccessful aspirations to be a novelist. Congress created the Holocaust Memorial Council in 1980 in order to fundraise for the United States Holocaust Memorial Museum in Washington, DC. The 68-member council meets twice a year and consists of 55 members appointed by the president. They serve five-year terms. Obama also appointed First Lady Michelle Obama’s long-time speechwriter, Sarah Hurwitz, to the council. If attacking Europe’s Jews over the purported acts of Middle Eastern Jews isn’t the definition of historical anti-Semitism, what is? As our intellectual and moral betters on the left have been informing us for the longest time, anti-Zionism does not equal anti-Semitism. So it only stands to reason that when you burn down a synagogue in Germany, you may be doing it solely as an overly enthusiastic expression of disagreement with Israel’s policies. This was the studious opinion of a court in Wuppertal, a small town in North Rhine-Westphalia. As reported today in the Jerusalem Post, a lower Wuppertal court, hearing the case in 2015, found that three German Palestinians who had torched the local synagogue in July of 2014 did so to draw “attention to the Gaza conflict” and had merely chosen Molotov Cocktails as their form of justified political speech. Last week, Wuppertal’s higher court affirmed the decision, declaring that the attack—that is, the burning of a synagogue approximately 2,700 miles away from the nearest Israeli town—was motivated not by anti-Semitism but simply by a strong but understandable distaste for the actions of some unruly Jews living in the Jewish state. To most people, attacking European Jews over the alleged acts of completely different Jews in the Middle East is the textbook definition of historical European anti-Semitism. To the court, it was simply a rational if overly rambunctious policy critique. The perpetrators were given suspended sentences. The last expression of similar anti-Israeli sentiment in Wuppertal occurred in 1938, when Nazis fueled by a passionate distaste for the conduct of Israel—the establishment of which was still ten years in the future—burned down the very same town’s synagogue.